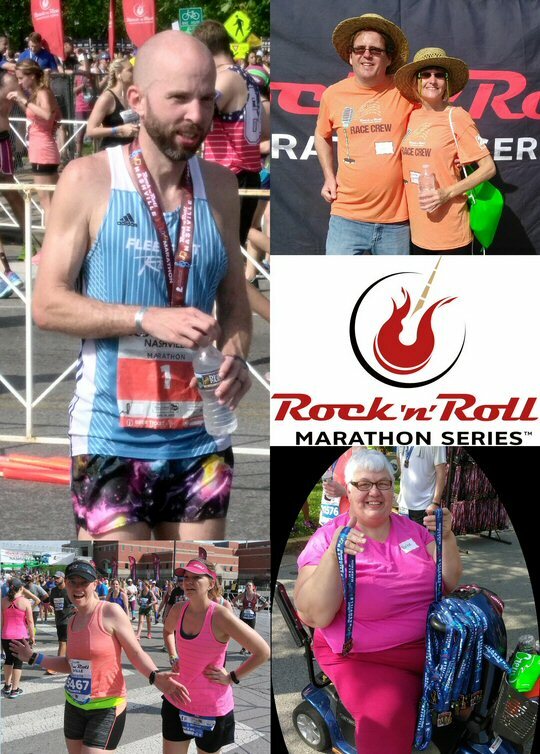 Local hero Scott Wietecha from Hendersonville, Tennessee braved harsh conditions to win his fifth consecutive St. Jude Rock ‘n’ Roll Nashville Marathon on Saturday, April 29, 2017. 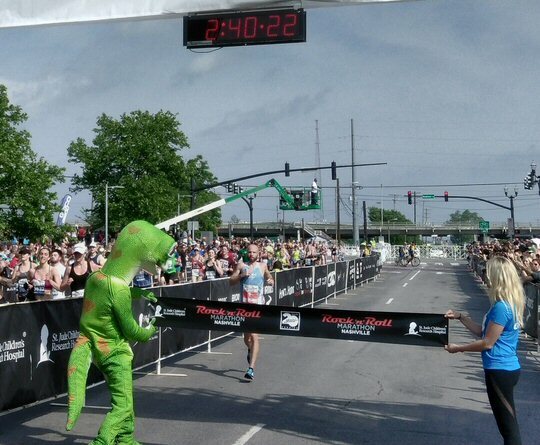 With temperatures climbing near the 90 degree mark the impressive marathon man took a little longer than usual to break the tape just outside of Nissan Stadium clocking in at his slowest time yet of 2:40:26. 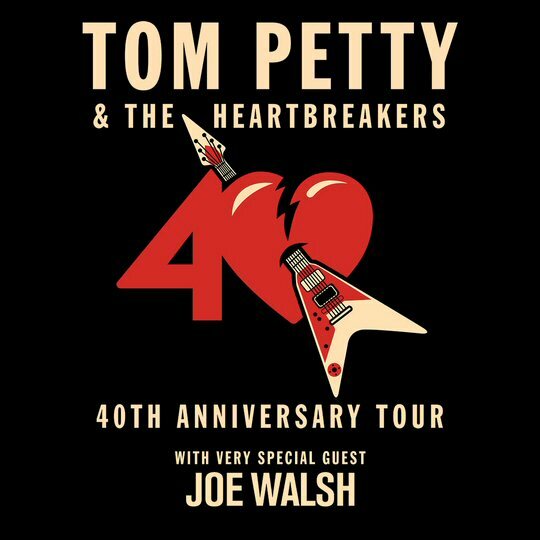 Scott Wietecha crosses the finish line for the fifth time in a row in Music City. But, victory was still sweet for Wietecha who needed a few minutes to compose himself before talking to the media about his latest amazing accomplishment. The symbolic “one for the thumb” was in doubt at the start due to pre-race interviews that found Scott downplaying his chances this year due to a weight-gain and a scaled back training program because as of late he “hated running”. In hindsight this seems like a head-fake to psyche out any potential competition as an ever slim and fit Wietecha approached the tape with no other contenders anywhere in sight. The annual tradition welcomed more than 30,000 runners, wheelchairs, and walkers this year to attempt the St. Jude Rock ‘N’ Roll Nashville Marathon & 1/2 Marathon through the streets of Music City that was lined with 28 stages as live bands performed for the athletes. Once again, the weekend was a celebration of health and vitality as the free Health & Fitness Expo took over the expansive Music City Center for two full days as race headquarters. The Expo is open to the public but it’s also where marathoners pick up their race number, swag bag, and t-shirt. Exhibitors were onsite offering free samples, showcasing running gear, sports apparel, health and nutritional information, and more. Scott moments after his tough win; MCN’s Rich and Laura Lynch; Longtime supporter of St. Jude’s Marlene Felton greets finishers with a smile; a pair of finishers. In addition to the runners an army of volunteers signed up to support the yearly event to hand out water, snacks and medals to every finisher of their respective race. Throw in family and friends who come out to root for the racers and you can see how the population in town gets a significant boost on this popular weekend that occurs every April – rivaled only by the outpouring of fans who turn out for CMA in June. 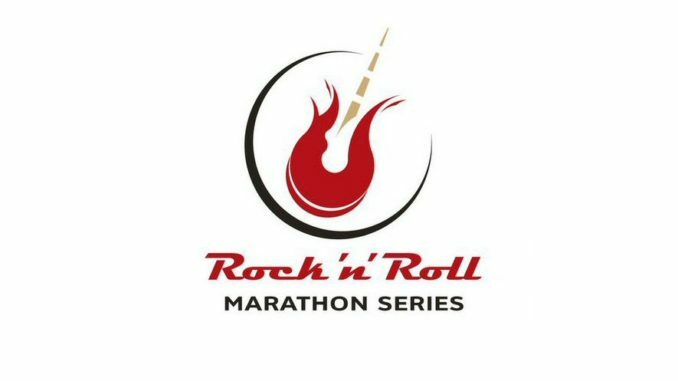 St. Jude Children’s Research Hospital is the premier charity of the Rock ‘n’ Roll Marathon Series. 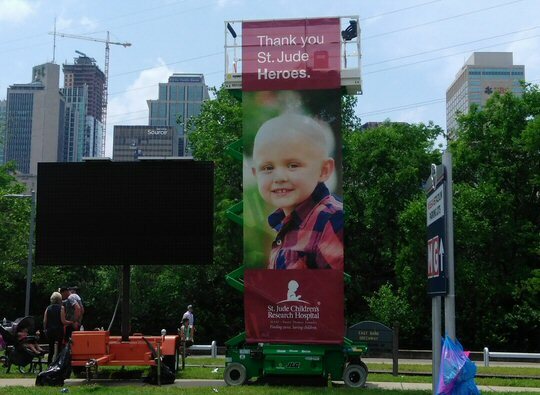 St. Jude Heroes are an exclusive group of dedicated athletes committed to raising funds for the lifesaving mission of St. Jude Children’s Research Hospital. St. Jude is leading the way the world understands, treats and defeats childhood cancer and other life-threatening diseases. Treatments invented at St. Jude have helped push the overall childhood cancer survival rate from 20 percent when the hospital opened in 1962 to more than 80 percent today. St. Jude won’t stop until no child dies from the illness. Runners Richard Wendt as Elvis and Rob Apple; Megan Ruger from The Voice. 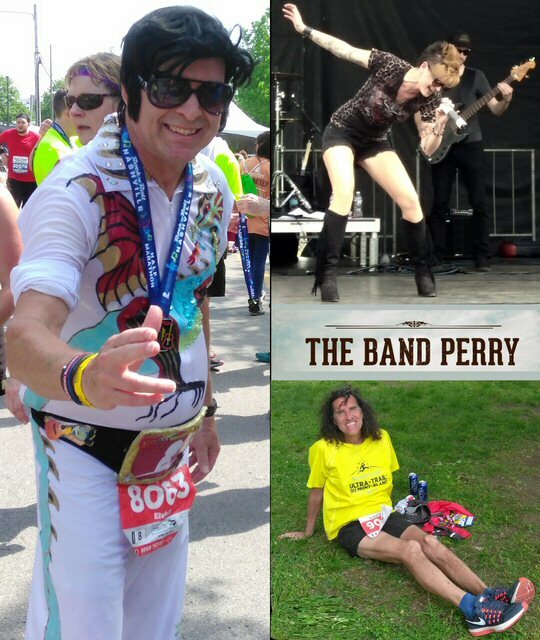 It wouldn’t be a Rock ‘n’ Roll Marathon without some rockers in the race. We were there as longtime marathoner Richard Wendt crossed the line dressed like the King himself – Elvis Presley. We also observed a gentleman who looked a bit like Geddy Lee from Rush but it turned out Rob Apple was actually a Nashvillian accountant who has participated in over 800 events all over the world. Both men reported that this year’s trek through the streets of Nashville was a particularly difficult challenge due to the extreme conditions. But, they both finished – and that rocks! Music is always a key component of the marathon in Music City and this year was no different. Runners still standing were invited to the Finish Line Festival with beer, food & music immediately after the race in the stadium parking lot. Local resident Megan Ruger rocked several sets showing off the chops that made her a fan favorite on TV’s The Voice. The Band Perry were the Toyota Rock ‘n’ Roll Concert Series headliner for Saturday night at Ascend Amphitheater where racers were seen relaxed and refreshed hours later with many sporting the ultimate sign of their day’s achievement – the fashionable finisher’s jacket – even if it was still brutally hot and humid outside as the sun went down on another successful race day in Nashville. St. Jude’s is a great reason to run in Nashville.